Ladybugs are generally regarded as a welcome insect in the garden because of their potential to gobble up large numbers of harmful pests. 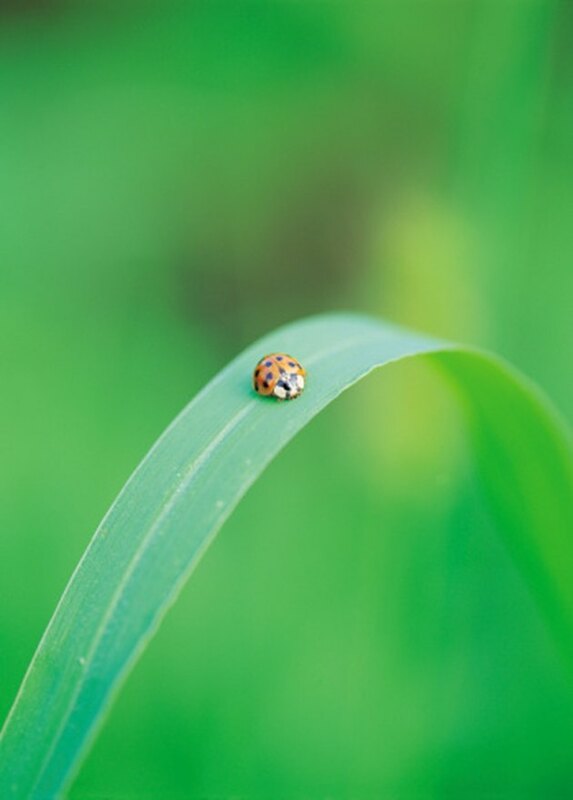 For this reason, in the early 20th century, government agencies and private citizens released the multicolored Asian lady beetle (Harmonia axyridis) — MALB for short — in order to bring pest populations under control. Unfortunately, the MALB multiplied and took up residence in houses over the winter. Their large numbers, unpleasant odor and annoying bite makes them a pest in these circumstances. While the MALB displays a wide range of colors, most are dark orange with a black M-shaped marking on their white thorax that distinguishes them from other ladybug species. If preventative methods don't stop the MALB from invading your home, the U.S. Department of Agriculture recommends vacuuming and trapping. The multicolored Asian lady beetle can become an annoying pest in homes. Tie a strip of gauze to a pencil and move it around windows, door frames and molding to find drafts and potential entry points for the MALB. Seal exterior cracks and crevices with caulk. Focus preventative measures on the south and west sides of your home, where the increased warmth from the sun may attract beetles. Close off cracks around windows and doors with weather stripping. Detach the hose wand from the vacuum cleaner. MALB trapped inside a vacuum cleaner can release an unpleasant odor that returns whenever you run the vacuum. Insert the toe of a knee-high nylon stocking through the bottom of the hose wand and pull the stocking through the hose wand. Fold the toe over the top of the hose wand to hold the stocking in place and insert the hose wand back into the vacuum cleaner. Fold the open end of the stocking over the open end of the hose wand. When you switch on the vacuum cleaner, the stocking catches any beetles that you vacuum up. Collect the beetles with the hose wand and remove the stocking. Tie off the end and dispose of the stocking. Cut the bottom out of a plastic butter tub or another smooth-sided plastic container. Cut the tub in half to act as a baffle. Spray the inside surface of the baffle and the inside of the funnel with Teflon spray, dust with talcum powder or apply another nonstick material. This prevents the ladybugs from crawling on or out of the trap. Glue or tape the baffle around the top of the funnel. Set the funnel inside a glass jar. Set a lamp with a fluorescent lightbulb over the baffle. Attracted by the light, the beetles slide down into the trap. Once trapped, you can destroy the beetles or release them in a garden or agricultural area where they can help control pests. How Can I Ward Off Skunks?